Servo Delta Robot by tinkersprojects is licensed under the Creative Commons - Attribution - Non-Commercial - Share Alike license. I found the Delta Robot to be interesting in how it works and how it can be used. I thought it would be interesting to try and make one out of parts I had around and 3D printed parts. 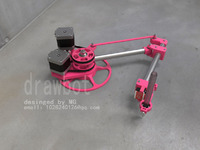 Unlike most of the Delta 3D printers, this robot uses a hinge method. 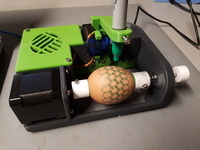 This method gives the robot more flexibility than the ball joint. 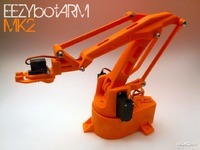 This robot uses 3 hobby servos with arms and rods to allow the robot to move in the XYZ. The controller is a servo shield on an Arduino UNO with some libraries to control the robot. One library is the Kinematics for the Delta robot and the another is to allow the computer to control the robot with GCode. The are others libraries used but they are not as important as these. Both libraries are important to control the positioning of the robot. Links for servo shield and the libraries are below.